On Friday, Dayton Power & Light (DP&L) updated the recent power outage situation still impacting residents not only in Fayette County, but all over the state. Checking on the DP&L website “Outage Map” will show that the power situation has been corrected for the vast majority of its customers, but still roughly 200 people in Fayette County sit without power following an ice and rain storm that struck on Thursday. According to the outage map, DP&L crews continued to work on Friday restoring power with crews from Indiana, Virginia and other parts of Ohio. With this assistance, more than 71,000 customers had their power restored in the first 24 hours. In total, Mary Ann Cabel, director of corporate communications at DP&L, said that over 80,000 customers were impacted by the storm. 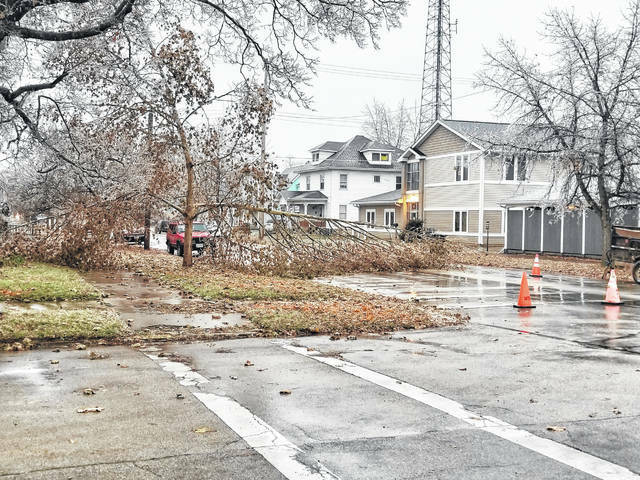 She said it was their goal to have 95 percent of impacted customers restored by 10 p.m. Friday, though they did warn restoration efforts will continue into the weekend. Cabel continued to emphasize the need for safety during this time and highlighted resources on the www.dpandl.com website that could be helpful. The first of these is an article that updates the ice storm outages named “Ice Storm Outage Update” on the main page of the website. Next, she pointed out an “Urgent Message” section on the DP&L outage map that is helpful for a quick update. Finally, on the main page under the “Safety & Education” tab are helpful tips for what to do before, during and after an outage, a guide to prepare a storm kit and more tips about how to prepare for the cold weather. According to weather.com, next to no precipitation is expected over the weekend with Sunday having the largest chance at 20 percent. Expect cold temperatures that will remain at freezing or below in the nighttime hours and will rise to about 40 degrees with clouds during the daytime. Stay with the Record-Herald for more updates on winter weather all this season.